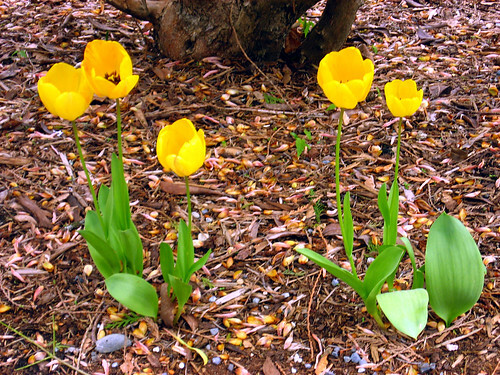 These 5, squat little yellow tulips were planted below one of my large rhododendron trees. They have a little brown patch in their centers. Looks like a Golden Apeldoorn. 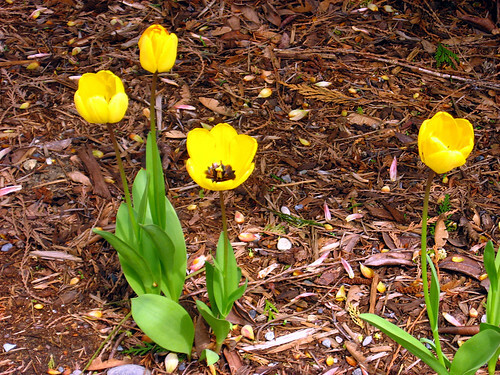 Golden Apledoorn (according to a quick Google search) are classified as “Darwin Hybrid” type tulips and are fairly tall (18-30 inches) but mine are actually quite short, around 12 inches tall with squat flowers 3 inches or less. They do look a lot like those, though, just much smaller/shorter. How many petals per tulip?